Scitec Arthroxon Plus is a dietary supplement in the form of capsules containing a unique combination of 8 active substances that support joint health. The ingredients used in the supplement are responsible for nutrition, protection, and regeneration of fibrous tissue, bone tissue, joints, joint capsules, tendons, and ligaments. It is usually physically active people who struggle with problems of the motor system. Intensive workouts are conducive to the exploitation of joints and their initially small dysfunctions can lead to serious injuries. Excessive joint overload also affects the elderly or overweight people. It is worth to implement an additional supplementation, which would not only prevent possible injuries but also support regeneration. Glucosamine sulphate of natural origin is a combination of glucosamine aminosugar with sulfur, which is characterized by the highest effectiveness, mainly due to the high level of bioavailability. Glucosamine itself is an endogenous molecule (certain amounts of it are produced by the body) which stimulate the synthesis of connective tissue and positively influences the mobility of joints. Its production, however, decreases with age, and in case of additional overloading, it is insufficient for complete protection and regeneration of joints, which is why it is very important to provide it as a supplement. Chondroitin sulphate, similarly to glucosamine, is part of the joint cartilage, where it inhibits catabolic processes, stimulates its regeneration and plays an important role in eliminating friction between the movable elements of the joint, because it has the ability to bind water molecules. Chondroitin sulphate may also reduce pain in the joints. Some study results even point to a comparable strength of the compound’s analgesic activity to NSAIDs. Hyaluronic acid is a biopolymer that is the main component of synovial fluid. It is responsible for "lubricating" joint surfaces, spreading nutrients and protecting cartilage cells from damage. Together with the chondroitin sulfate, it can form water-binding aggregates that form a special gel with cushioning properties. Type II collagen is mainly found in joint cartilage, tendons and skin, giving them elasticity and tensile strength. As a diet supplement, it strengthens the joints by improving their mobility, making the tendons and ligaments more elastic, increasing their resistance to loads, as well as reducing pain and inflammation in the joints after an injury. The preparation contains a hydrolyzed (purified) form of collagen, characterized by high bioavailability. Methylsulfonylmethane (MSM) is a chemical compound containing biologically available sulfur, used to produce molecules such as collagen and glutathione. MSM is not naturally synthesized in a human body. Although it occurs in many plants that are part of a diet, supplying it with food only may be insufficient. MSM displays its activity mainly by silencing inflammatory processes, e.g. by indirectly affecting the reduction of proinflammatory cytokines. It also acts as an antioxidant, leading to reduced production of free radicals. NEM® is a powdered eggshell membrane that increases the strength of the shell and protects the egg's content against microbial penetration. As a component of the preparation, it supports the proper functioning of joints, being the source of the aforementioned glucosamine, chondroitin, and hyaluronic acid. L-ascorbic acid, widely known as vitamin C, has a number of functions in the system. Vitamin C added to the preparation intensifies the processes of biosynthesis and the incorporation of collagen into the connective tissue. It also acts as an antioxidant, eliminating free radicals that damage the surface of cartilage. Manganese plays a key role in the process of bone mineralization, it strengthens the connective tissue, enables efficient functioning of joints and increases protection against free radicals. Its deficiencies are considered one of the causes of osteoporosis. 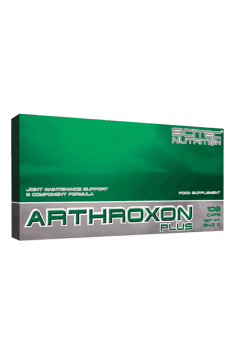 In summary, Scitec Nutrition Arthroxon Plus is a comprehensive combination of components supporting the functionality of the motor system. The supplement is addressed not only to athletes, but also individuals wanting to enjoy healthy joints for longer. Take 5 capsules a day before a meal. Preparations supporting health of the musculoskeletal system have to be used for a longer period of time in order to achieve satisfying effects. The minimal recommended period is 3 months. The above indicated dosing should be sufficient as prophylaxis and support for light ailments. Bovine Gelatin, Anti-Caking Agent (Magnesium Stearate), Colors (Titanium Dioxide, Copper Complex of Chlorophyllins).